Caernarfon Castle was built in the wake of the second War of Welsh Independence to serve as the administrative centre for North Wales. It was the most elaborate of all of the castles raised by Edward I and was designed to imitate the Imperial Roman city of Constantinople. It was attacked during both the Madog ap Llywelyn and Owain Glyndŵr rebellions. 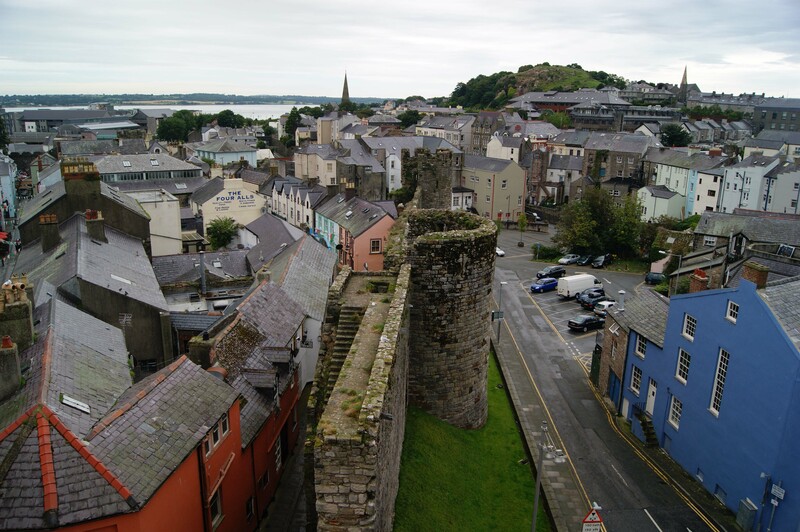 Caernarfon occupies a strategically important location overlooking the Menai Straits, a 500 metre wide stretch of water that separates mainland Wales from the Isle of Anglesey. The crossing was critically important to North Wales as the fertile agricultural land of Anglesey meant it was the region’s main food source. Accordingly control of the Menai Straits directly affected the ability of the populace of the mainland to resist occupation. This was not lost on the Romans who built Caernarfon Roman Fort, known as Segontium, nearby in the late AD 70s as the military suppressed the Ordovices tribe. The fort remained in use throughout the next three hundred years and was particularly important in the latter decades of the Roman era as it provided a coastal defence role guarding against Irish pirates. The fort was probably abandoned when the Roman Army withdrew from Britain in the early fifth century AD. The remains of Caernarfon Roman Fort. When the Normans arrived in North West Wales in the late eleventh century, they also appreciated the importance of Caernarfon. Around 1090 Hugh of Avranches, Earl of Chester built an earth and timber motte-and-bailey castle there. Hugh opted for a different site from the Romans and built his castle directly adjacent to the Menai Straits on a peninsula of land protected on the south side by the River Seiont and on the east by the Cadnant Brook. This castle was seized by the Welsh in the early twelfth century and presumably destroyed. 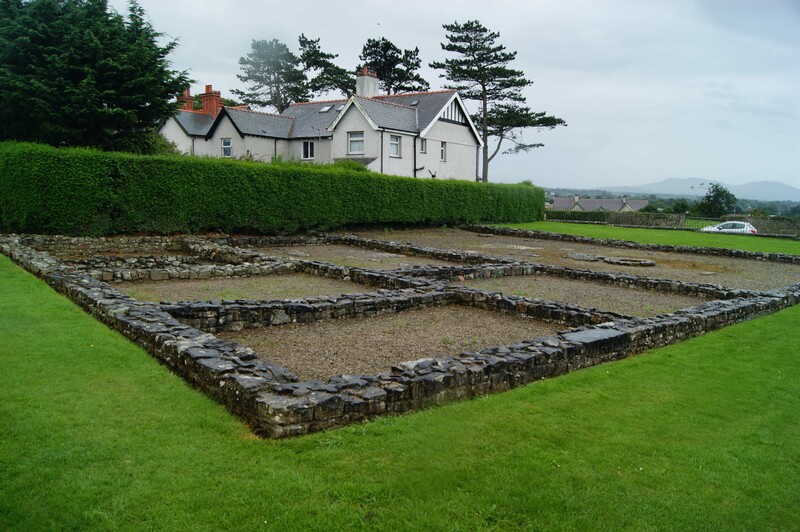 However, some form of Hall was retained on the site by the Welsh Princes of Gwynedd as both Llywelyn ap Iorwerth and Llywelyn ap Gruffudd were recorded as staying there during their reigns. In the two centuries that followed their conquest of England, the Normans had vied with the native Welsh to secure control of portions of Wales. Ownership of land ebbed and flowed between the two factions and the high point of Welsh dominance came in 1267 when Henry III agreed the Treaty of Montgomery which recognised Llywelyn ap Gruffudd as Prince of Wales. However, when Edward I became King of England in 1272, relations with Gruffudd broke down resulting in the First War of Welsh Independence (1276-7). The Anglo-Norman war machine crushed the Welsh and Edward took control of all land to the east of the River Conwy. Gruffudd was allowed to retain his title of Prince of Wales but, in effect, his domain had been reduced to little more than Gwynedd. Peace did not last long though and the Second War of Welsh Independence started in 1282. This time Edward I resolved to conquer Wales in its entirety and launched a three pronged attack from Carmarthen, Chester and Montgomery plus a maritime assault on Anglesey. Wales was overrun, Gruffudd was killed at the Battle of Orewin Bridge (1282) and Welsh strongholds were systematically besieged and captured. To secure his victory, Edward I started construction of a chain of fortresses around Snowdonia, the traditional redoubt of the Welsh Princes. Caernarfon was one of these new facilities but was also built with the intention that it would serve as the centre of English Government in North Wales. Work started on Caernarfon Castle and the Town Walls in 1283 concurrently with other fortifications at Conwy and Harlech. 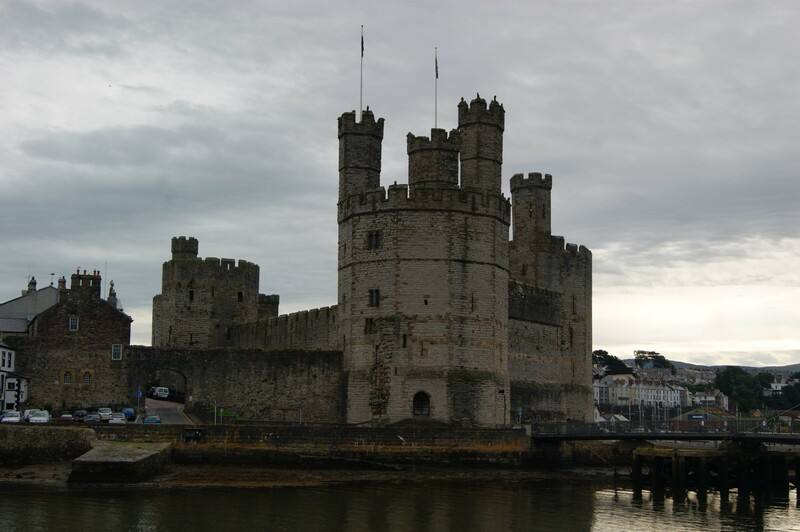 However, Caernarfon was by far the most elaborate and expensive of the three; Edward I ultimately spent in excess of £27,000 at the site. He was particularly keen to exploit the reference to Caernarfon in the Mabinogion, a twelfth century document that recorded oral sagas of Welsh history in circulation at the time. One of these stories was the 'Dream of Macsen Wledig', a story about Magnus Maximus (Macsen Wledig), Roman emperor from AD 384 to AD 388, who allegedly married Elen, the daughter of a Caernarfon chieftain. 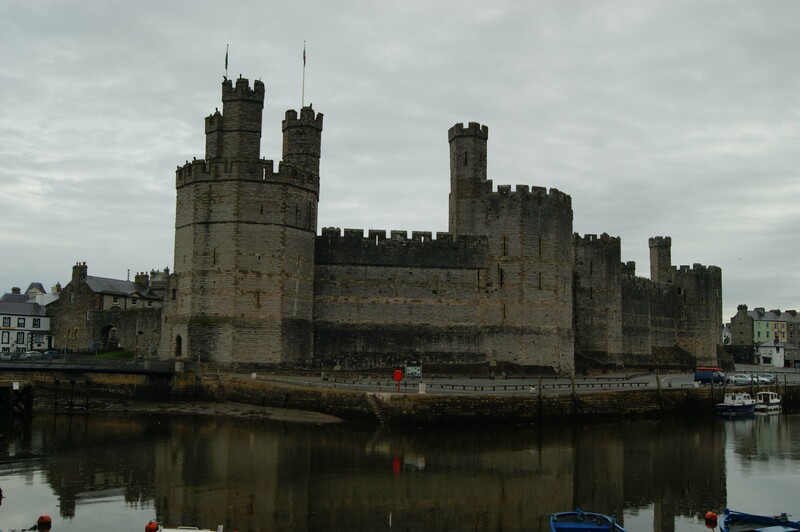 To demonstrate a link with this legend, Caernarfon Castle was built with polygonal towers and incorporated darker stone banding in imitation of the walls surrounding the Roman Imperial capital of Constantinople (modern day Istanbul). The suggestion to the locals was clear; Edward I was an effective conqueror, an Imperial power and continuity with what had gone before. In an amazing coincidence, the English found the body of Magnus Maximus at Caernarfon during building work on the castle. Edward I ordered his reburial nearby with a degree of pomp. The castle was built with polygonal towers in imitation of the Imperial capital of Constantinople. The castle was built around the existing earthworks of the earlier fortification under the direction of the King's chief engineer, Master James of St George. The castle was a long but narrow enclosure that was divided into Upper and Lower Wards. Two major gateways - King's Gate and Queen's Gate - provided access into the Upper Ward. Seven large polygonal towers dominated the structure and provided the residential accommodation. Two smaller turrets flanked the Queen's Gate. The town walls were built concurrently at the same time and enclosed an irregular area extending 250 metres north of the castle. The town was laid out in a grid pattern with High Street, the main road through the settlement, running between two major gates. Eight circular towers guarded the town wall. 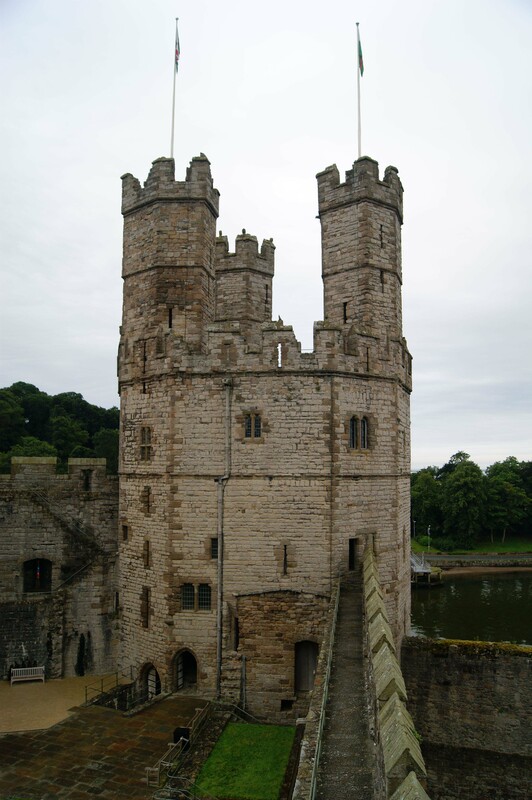 In March 1284, with work on Caernarfon Castle and town underway, the Statute of Wales was sealed by Edward I. This legislative measure merged the three shires of the newly conquered territories into a single political entity administered from Caernarfon. The following month Queen Eleanor, who had accompanied her husband to Caernarfon, gave birth to the future Edward II at the castle. Never one to miss a political opportunity, Edward I promised the Welsh "a Prince born in Wales, who did not speak a word of English" and promptly gave his baby son the title of Prince of Wales. Regardless, tensions with the native Welsh simmered and erupted into rebellion in 1294 under the leadership of Madog ap Llywelyn. The castle was still incomplete by this stage; the south walls had been built to a reasonable height but the castle's north walls were only at foundation level and were defended solely by a ditch and the town walls. The rebels overcame the latter and simply seized the castle. The Sheriff was summarily executed by the rebels, all timber structures were burnt and extensive damage was done to the masonry structures. However, the English response was swift and Royal forces swept back into Wales to crush the revolt. Caernarfon was soon recovered and work started on repairing the damage and completing the defences. Work continued apace from July 1295 through to the end of 1301 alongside construction of a new fortress, Beaumaris Castle, on the Isle of Anglesey. Thereafter a hiatus in construction seems to have occurred, perhaps due to treasury resources being directed towards Scotland, but by 1316 work had resumed. In 1316 the Hall of Llywelyn, a timber framed court formerly used by Llywelyn ap Gruffudd, was moved from Conwy and erected within the Caernarfon Castle's Lower Ward. Work continued on the castle until 1330. 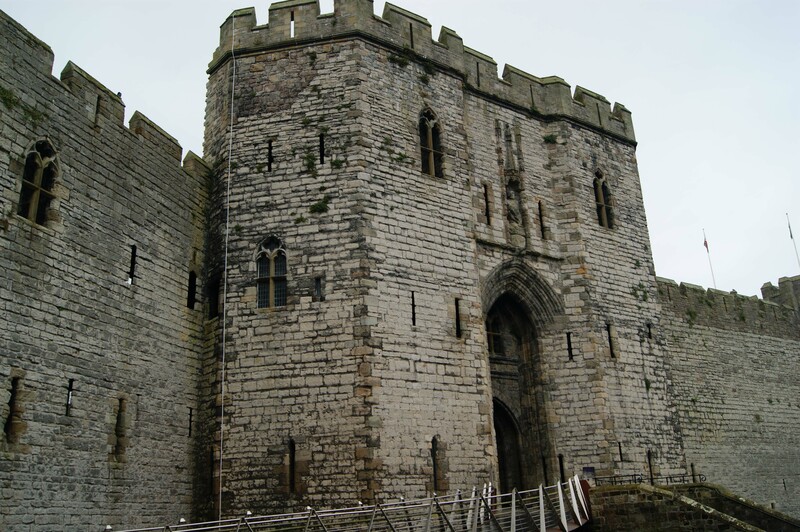 Caernarfon Castle was attacked in 1403 and 1404 during the rebellion of Owain Glyndŵr. Unlike many other fortifications across Wales, Caernarfon resisted the attacks and provided a secure base from which Government forces could operate against the rebels although it took almost ten years to suppress the uprising. Thereafter the castle remained garrisoned until the Tudor era but the accession of Henry VII saw a significant change in Government policy. Henry had come to power with help from the Welsh and he continued to rely on their support once he was crowned. He systematically dismantled the power of the Marcher Lords and introduced equality for the Welsh in law. This ended any requirement for great fortifications such as Caernarfon Castle and accordingly the structure was neglected. A survey in 1620 reported most of the structure was roofless but it was hastily reactivated and garrisoned for the Royalists during the Civil War. It was attacked by Parliamentary forces on several occasions but it wasn't until 1646, after Royalist hopes of victory had faded, that the castle was surrendered. Thereafter the castle was largely neglected although it was used in 1911 to host the investiture ceremony for Prince Edward (later Edward VIII) as Prince of Wales and served the same role in 1969 for Prince Charles. Davies, R.R (1987). 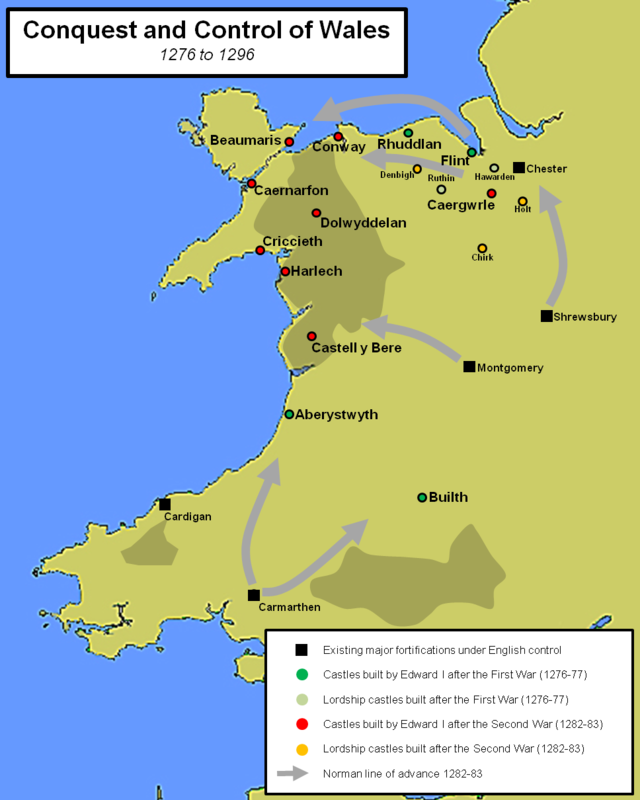 Conquest, Coexistence and Change: Wales 1063-1415. Oxford. Emery, A (1996). Greater Medieval Houses of England and Wales Vol. 2. Cambridge University Press, Cambridge. Gravett, C (2007). Castles of Edward I in Wales 1277-1307. Osprey, Oxford. Guest, C.E (1998). The Mabinogian. Dover Publications. Kenyon, J (2010). The Medieval Castles of Wales. University of Wales Press, Cardiff. Kighty, C (1991). 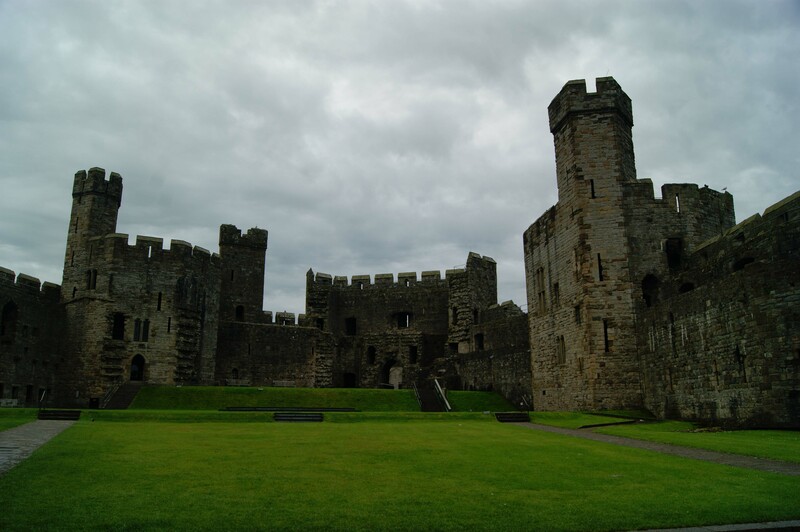 Caernarfon: A Royal Palace in Wales. Cardiff. Purton, P.F (2009). A History of the Late Medieval Siege: 1200-1500. Boydell Press, Woodbridge. Salter, Mike (1997). The Castles of North Wales. Malvern. Taylor, A (1993). Caernarfon Castle. CADW, Cardiff. 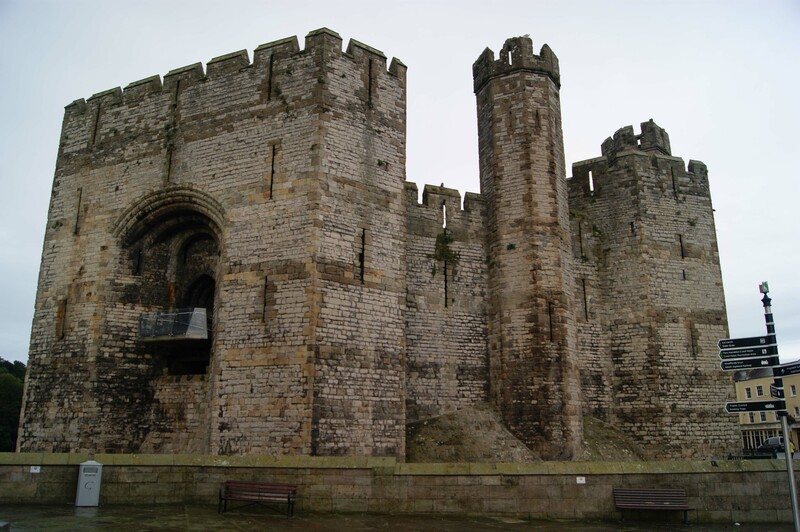 Caernarfon Castle is arguably the greatest of Edward I's Welsh castles that served as a Royal palace and an administrative centre for North Wales. The masonry remains are largely as completed in 1330 although portions have been restored in later years. The town wall circuit is also largely complete. 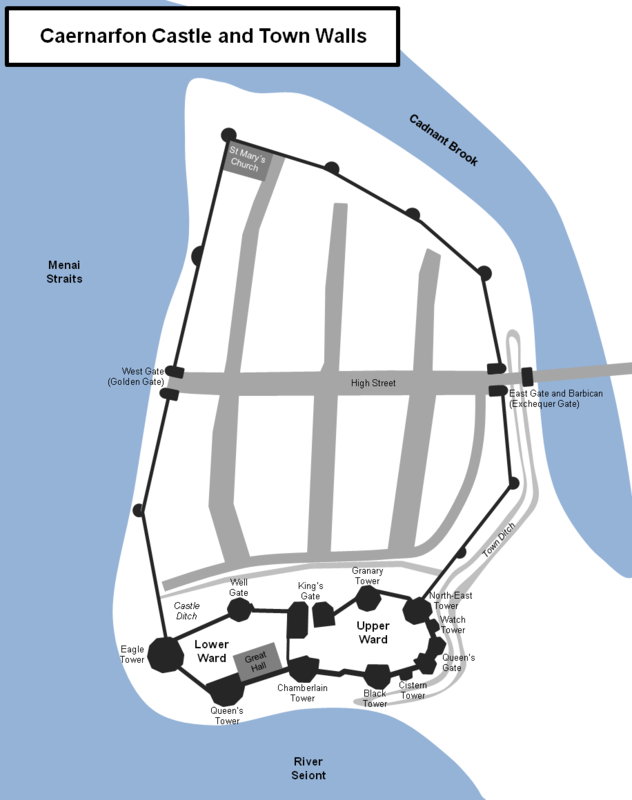 Caernarfon Castle and Town Walls Layout. The castle had seven polygonal towers, two twin towered gates and two turrets all joined by a massive curtain wall. The town walls were built at the same time. Caernarfon Castle. The castle was constructed from coursed limestone but coloured banding was built into walls in imitation of the great Roman walls of Constantinople (Istanbul). This was intended to demonstrate a link with the 'Dream of Macsen Wledig', a story recorded in the Mabinogion about a Roman emperor who married the daughter of a Caernarfon chieftain. King's Gate. This was the main entrance into the castle but, despite its imposing appearance, it was located on a side road off the town's main High Street. Queen's Gate. 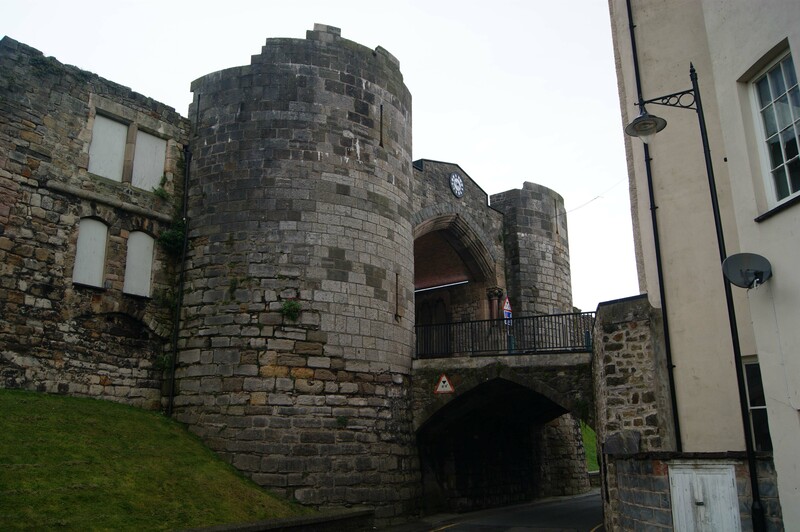 The Queen’s Gate was built over the motte of the earlier Norman Castle and this explains why the gateway is so far above the street level. A dry ditch originally fronted this entire section of the castle. Eagle Tower. The Eagle Tower was the largest tower in the castle. It was topped with three small turrets each topped with carved heads and eagles. Upper Ward. The Upper Ward is thought to occupy the site of an earlier Norman Castle. Conquest and Control. Edward I built and modified numerous castles in North Wales to isolate Snowdonia, redoubt of the Gwynedd Princes. 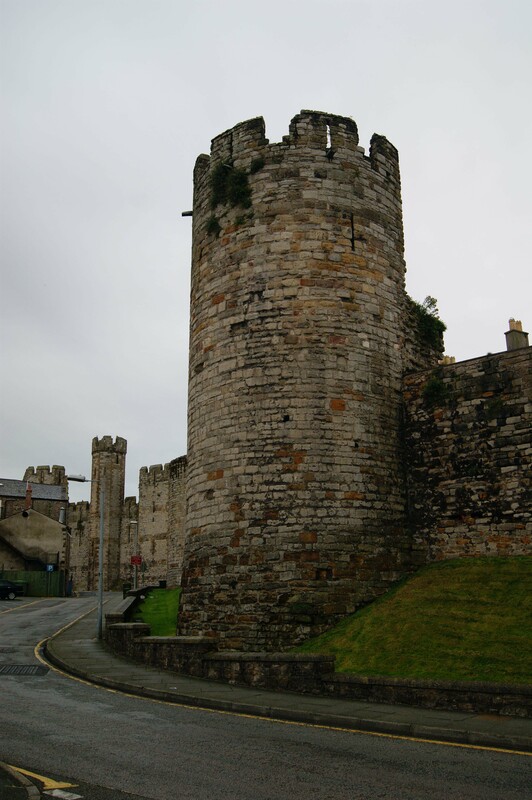 Caernarfon Town Walls. The town walls were built concurrently with the castle. Unlike the polygonal towers of the latter, the town wall towers were circular. Town East Gate. 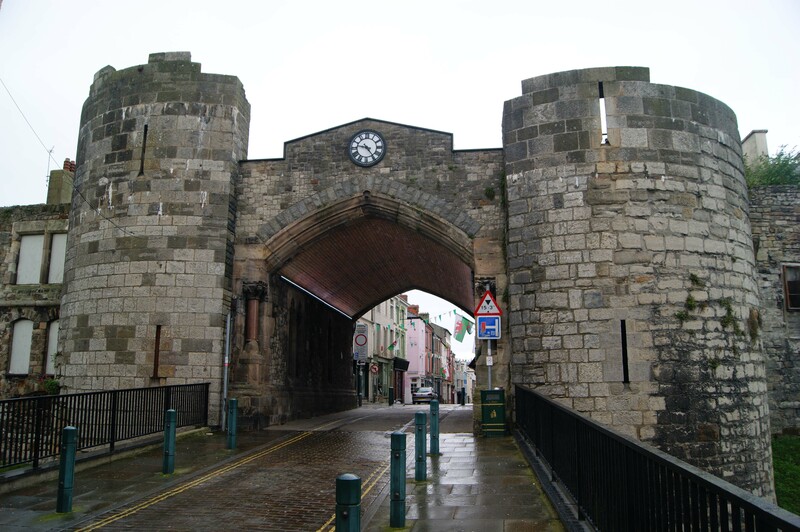 Also known as Exchequer Gate, the East Gate was built around 1301 but was modified in 1767 to serve as the Town Hall. It acquired its modern appearance in 1873 when it was converted into the town’s Guildhall. Town West Walls. The town's quays were on the western side and accessed via the Water Gate. Caernarfon Castle is a major tourist attraction and well sign-posted. There is a car park directly adjacent to the castle.